Vernon House at the corner of Clarke and Mary Streets in Newport, around 1900. 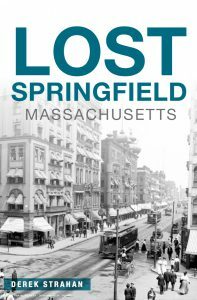 Image courtesy of the Providence Public Library. 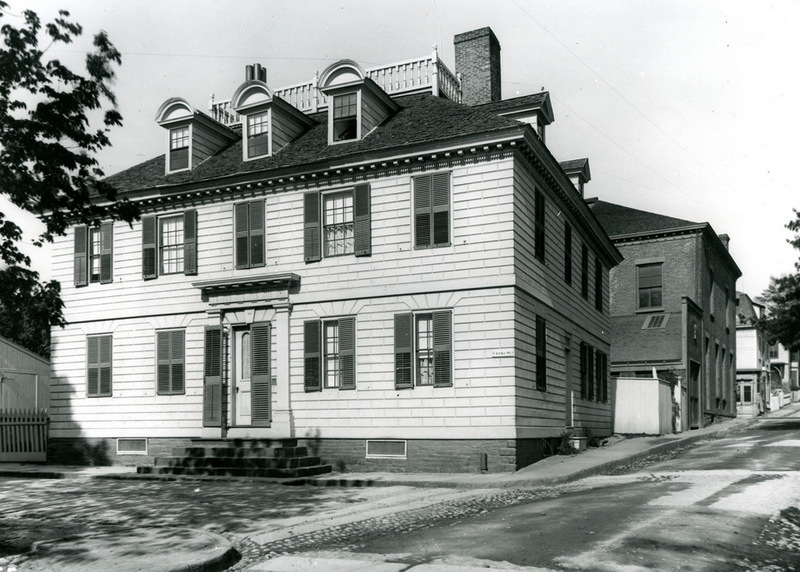 This house is perhaps Newport’s finest surviving Georgian-style house, with an exterior appearance that dates back to around 1759. However, the house itself is actually significantly older, having been built sometime in the late 17th or early 18th centuries. The first recorded owner was William Gibbs, a painter who moved from Boston to Newport in the early 1700s and was living in this house by 1708. Whether he built the house himself or purchased it from a previous owner is unclear, but the architecture of the original structure suggests that it was built sometime around 1700. William Gibbs lived here until his death in 1729, leaving an estate valued at about 2,300 pounds. His daughter Elizabeth, whose husband William Gardner had been lost at sea three months earlier, inherited the property, remarried in 1732 to James Martin, and then died in 1735. This sequence of events set up an interesting legal battle after her death. Under English law at the time, her father’s property would have gone to her husband, and then to their children. However, if her husband – who had been missing for three months – died before her father, Elizabeth herself would have inherited it, and the property would have gone to her second husband after her death. Martin argued that, by all accounts, Gardner was dead before Gibbs’s death in 1729, but he ultimately lost his case and the property remained in the Gibbs-Garnder family until 1744. The house was subsequently owned by a Patrick Grant and by Charles Bowler, the Collector of Revenue in Newport, who purchased it around 1753. In 1759, Charles sold it to his son, Metcalf Bowler, a prominent merchant who was among he wealthiest men in colonial Rhode Island. Shortly after purchasing the house, Metcalf had the house expanded and renovated to its current Georgian-style appearance. There are no surviving records of who the architect was, although tradition suggests that it may have been Peter Harrison, the prominent colonial-era architect who designed several buildings in Newport during the mid-18th century, including the Redwood Library, Touro Synagogue, and the Brick Market. Metcalf Bowler was active in Rhode Island politics, particularly in the years leading up to the American Revolution, when Newport’s shipping industry was in its golden age. He served as one of Rhode Island’s delegates to the Stamp Act Congress in 1765, as speaker of the colonial legislature from 1767 to 1776, and was appointed to the state supreme court in 1776. However, during this time he was also a paid informant for the British army, working as a spy for General Henry Clinton, apparently in order to safeguard his property during the British occupation of Newport. His role as a spy was not discovered until the 20th century, but the war was devastating for Newport’s shipping industry and Metcalf Bowler lost much of his fortune as a result. Bowler only lived in this house until 1773, when he sold it to William Vernon, another merchant who was involved in the American Revolution. However, unlike Bowler, Vernon remained loyal to the Patriot cause, and in 1777 the Continental Congress appointed him as president of the Eastern Navy Board, effectively making him the de facto equivalent of Secretary of the Navy. In this position, he worked to develop the fledgling American navy, and he even loaned his own money – at little or no interest – to the perpetually cash-strapped government, to enable them to meet some of the many pressing wartime demands. During the American Revolution, Vernon was directly associated with some of the leading figures of the era. His son William traveled to France in 1778 under the care of John Adams, who was also traveling with his own son, 11-year-old John Quincy Adams. Then in 1780, after the British occupation ended, the Comte de Rochambeau arrived in Newport with 5,500 French soldiers, who remained here while awaiting deployment against the British. Rochambeau used Vernon’s house as his headquarters, and during this time his visitors included the Marquis de Lafayette and George Washington, with Washington arriving here in March 1781 to meet with Rochambeau. Several months later, in June, the French soldiers departed Newport for Virginia, for a campaign that ultimately led to the decisive American and French victory at Yorktown in October. In the years following the American Revolution, William Vernon continued to live here in this house. His son Samuel served in the war, and in 1784 married his cousin Elizabeth Almy. The couple lived here with his father, and had eleven children, nine of whom survived infancy. In the meantime, the younger William remained in France for many years, where he became a favorite in the court of Louis XVI. He remained in France through the French Revolution, but returned to Newport in 1796, bringing with him a significant collection of paintings that included a copy of the Mona Lisa that is reputed to have been painted by Leonardo da Vinci himself. 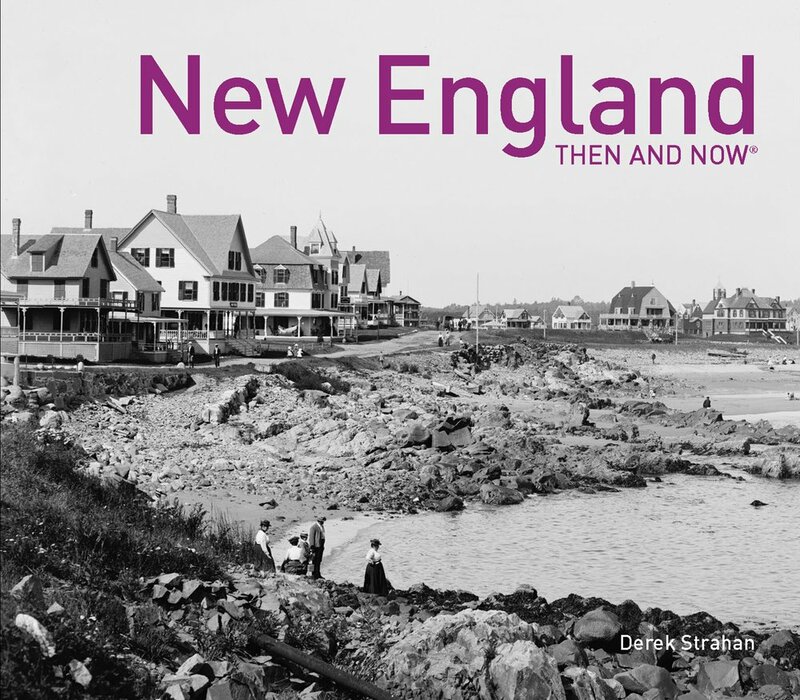 Both of the Vernon brothers were prominent men in Newport, with Samuel running a prosperous merchant business and serving as president of the Newport Bank and the Newport Insurance Company, while William was the secretary of the Redwood Library for many years. They inherited the property after their father’s death in 1806, owning it until William’s death in 1833 and Samuel’s a year later. However, the house would remain in the Vernon family until it was finally sold in 1872, 99 years after William Vernon purchased it from Metcalf Bowler. For the rest of the 19th century, the house was used as offices. Tenants included prominent geologist Raphael Pumpelly, as well as architect Clarence S. Luce, both of whom had offices in the building in the early 1880s. In 1912, about a decade after the first photo was taken, the house was purchased by the Charity Organization Society, who did some restoration work. It was later the home of the Family Service Society until the 1960s, when it was sold and again became a private residence. Because of its historic and architectural significance, Vernon House was designated as a National Historic Landmark in 1968. Since then, it has been well-preserved, and there are hardly any noticeable differences between the photos aside from minor details such as the shutters, which may not have been original to the house anyway. The house remained privately owned until 2009, when it was donated to the Newport Restoration Foundation. 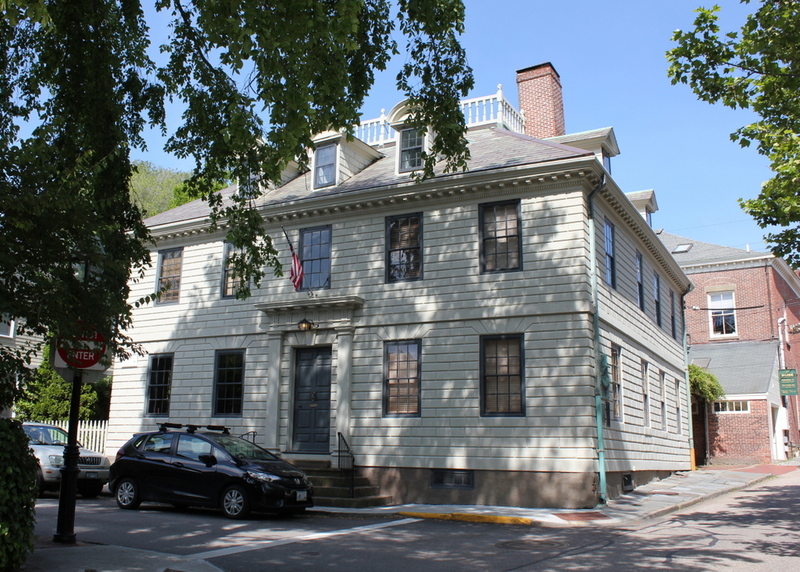 This organization has preserved a number of historic properties in downtown Newport, and it continues to own Vernon House and rent it out as a residence.